There are 16,629 students in the 95th legislative who depend on me to advocate for them at the state capitol. Each one of them deserves the chance to receive a world class education. Their future – that is what this fight for school funding reform is all about. In the past three years, I have served on three school funding commissions and taskforces. I can tell you firsthand – throughout those meetings there has been genuine, groundbreaking, bipartisan work done to produce a new, fair, evidence-based school funding formula. Unsurprisingly, at the last second, negotiations were cut off, amendments were filed that benefitted Chicago and the bill was forced through on a mostly partisan basis. Good bipartisan work was abandoned for partisan politics that send more money to Chicago first. You’ll hear both sides argue about whether or not there is a Chicago bailout or what that means. Let me share what sending Chicago more money means for my neighbors in the 95th District. In the 95th, there are 16,629 students in school districts like Taylorville, Pana, Carlinville, Gillespie, North Mac, Hillsboro and Staunton. That equals 0.85% of the students throughout the state of Illinois. Chicago has 367,003 students. That equals 18.74% of the students in Illinois. Under Senate Bill 1, Chicago will receive 63.62% of the new money. Meanwhile students in the 95th District will receive 0.5% of the new money. Once the bailout for Chicago is removed from SB1, Chicago’s students receive 19.06% of the new money while students in the 95th District receive .82% of the new money. That is fairness. 19.06% of new money for 18.74% of the students in Illinois and 0.82% of the money for 0.85% of the students. Our students downstate deserve a fair shake. We need a new school funding formula – one that treats every school district the same and one that sends money first to the students and school districts that need it most. SB1, in its current form is not that solution. With structural manipulations in the base funding minimum (where money goes first), that means millions of dollars are shifted first to Chicago before any new money is dispersed to all other 851 school districts. After years of education cuts under previous administrations, I cannot blame the schools who are desperate for more money. They need it. We owe it to the students they serve. However, we as downstaters, must fight for our fair share. We cannot settle for second fiddle. Lord knows Chicago isn’t settling. Our kids deserve more. Now, the political games continue. Instead of abiding by the process every other legislature uses – sending a bill to the governor once it passes, they’re holding on to it. To end the political gamesmanship, Governor Rauner has called us back into special session to get this done. 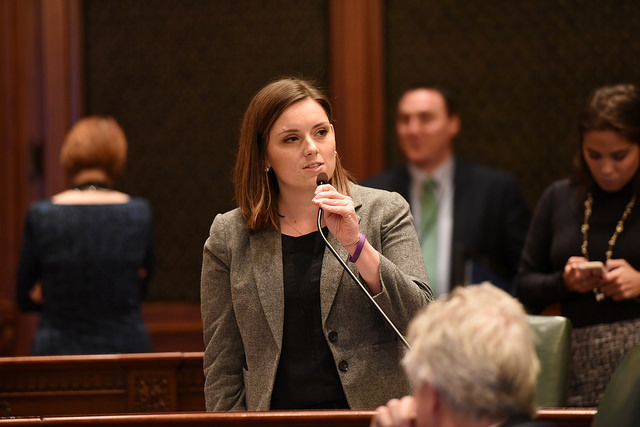 There are two options – work with us in the legislature to come to a bipartisan solution or send the bill to the governor and let him take out the Chicago bailout. Either way, it is immoral to hold the school funding bill and hold our schools hostage until there is a crisis. No special deals, No hostage taking. Let’s get this done for every school and every student, now.